The Tollywood young actor Bellamkonda Sai Sreenivas has been mostly doing action-centric commercial entertainers from the beginning of his career, he has worked on his physique and showcasing Bellamkonda Sai Sreenivas Six-Pack Abs in ‘Saakshyam’ film No doubt, he has surely sweated it out for the new look. 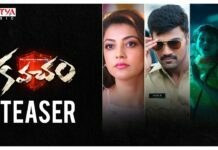 For the first time, Bellamkonda Sai Sreenivas Six-Pack Abs in a film. Apart from developing a neatly toned body for his role, Sai Sreenivas Bellamkonda also learned flyboarding, jetskiing, sandboarding, desert biking, ATV riding and BAM cycling for 15 days in Dubai. The film will have five high-octane action sequences and Sai took a lot of risk to perform them, aver makers. The action-adventure Saakshyam Movie stars Pooja Hegde in the female lead. Sriwass has directed the film and Abhishek Nama has produced it. 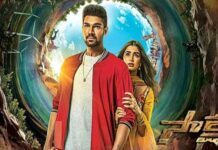 Saakshyam Full Movie is hitting the screens on July 27.